For the past few weeks, I have been working alongside other Duke engineers and our community partners in Manantenina, Madagascar, to implement a gravity-fed water distribution system that will provide clean water for the village. The first phase of our project involved verifying the viability of the system’s water source. While we had already completed the pipeline design upon arriving in Manantenina, we wanted to conduct further data collection to verify the accuracy of our data and account for variations from the original design before beginning construction. As a first-year engineering student who had only taken introductory engineering courses, I was relatively unfamiliar with the data collection skills and techniques necessary to verify the source’s viability. However, one skill that I had learned about was surveying. Surveying is the process of measuring the relative position of different three-dimensional points along a route or on a span of land, and it’s a crucial skill for any civil engineer. This past spring, I learned about surveying in “Engineering the Planet,” an introductory civil and environmental engineering course taught by Professor David Schaad. The course had an entire unit devoted to surveying, in which Dr. Schaad taught us the fundamentals of mapping routes, land area spans, and the facades of buildings using a theodolite and a stadia rod. Because the distribution system will be powered by gravity, taking into account the elevation change relative to the water source along the pipeline route was crucial to ensuring that the system will be effective. Our team had used elevation data from an online database to design the pipeline, but this data was measured by a satellite; the only way to ensure that our data is completely accurate was to survey the entire pipeline route – 1,700 meters twisting along the slopes of a mountainous rainforest – ourselves. To my surprise, I emerged as our team’s surveying expert; other freshmen on the team had not yet taken Engineering the Planet, and team members at a more advanced stage of their engineering education had not surveyed since their freshman year and needed review. Before we began surveying, I had the opportunity to teach members of our team how to use a theodolite and stadia rod to collect data, the notation for recording surveying data, and how to calculate elevation change based on this data. 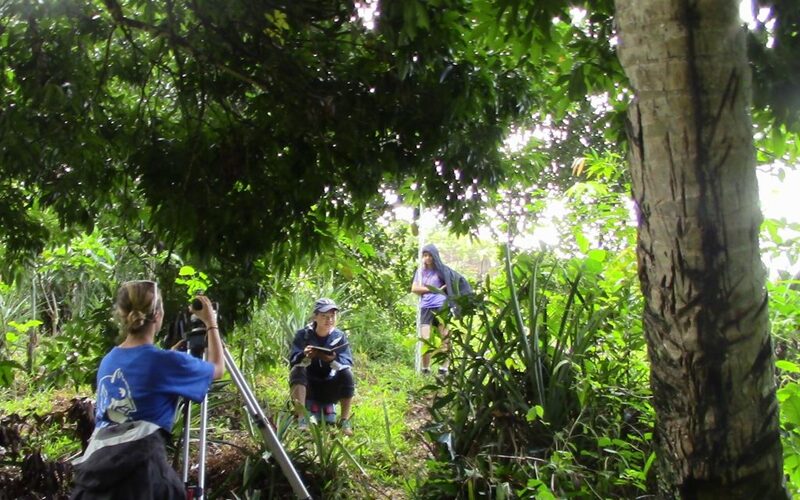 Once we began surveying, I led our team’s week-long effort to survey the pipeline route, aiming the theodolite telescope through dense foliage to capture measurements and using a banana leaf to shield the surveying notebook when it rained. Recording our final measurement was the most rewarding feeling in the world. Never would I have imagined that I would survey in a rainforest, but I am so grateful for the opportunity. Not only did I vastly improve at surveying, but I also had the opportunity to apply my engineering education towards an incredible cause. I cannot wait to pursue more opportunities to use my engineering education for good once I return to Duke!